Whisk together eggs, cream, spices and orange zest. Slice bread in half horizontally without cutting all the way through the whole slice of bread. Stuff each pocket with half the mashed banana. Heat your skillet over medium heat. Melt butter to cover bottom of your pan. 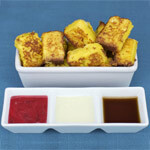 Dip bread slices into egg mixture, generously coating each piece. Place in your skillet and fry until browned. Flip over and brown other side. Remove from your pan and place in your oven for 10 minutes. 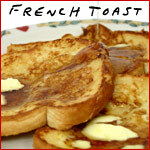 Remove French toast from oven. Cut each piece of French toast on the diagonal and drizzle melted semisweet chocolate over them. 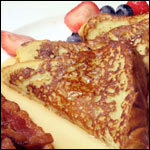 Dust French toast with icing sugar and serve with fruit slices as garnish. A single sprig of mint atop each serving is the perfect kiss of love. 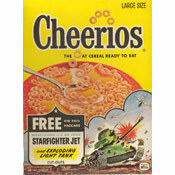 This delicious treat works as either as breakfast or desert. Can you imagine having chocolate for breakfast every morning? I can! Have a great breakfast! Or desert! It works both ways! What do you think of Chocolate Drizzle Banana French Toast? 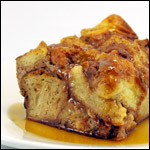 This was delicious, I used fresh bread and a bit more chocolate, but the cinnamon and nutmeg really bring it together. So so tasty.